Ahmed drives his donkey cart through the streets of Cairo, delivering butane gas cylinders to his father's customers. He knows everyone and has a part to play in the life of the city. He is proud to be strong enough to help his family, but most of all he is proud of his precious secret, a secret that he keeps until the end of the day. Ahmed drives his donkey cart through the streets of Cairo, delivering butane gas cylinders to his father's customers. He knows everyone and has a part to play in the life of the city. He is proud to be strong enough to help his family, but most of all he is proud of his precious secret, a secret that he keeps until the end of the day. 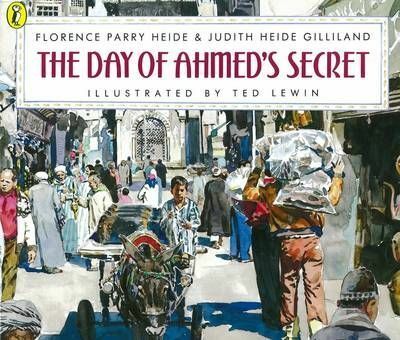 The book reveals a lot about Ahmed's life, and finally his secret - that he can write his name.